Finally, a new outfit! I’ve been waiting to post about this project until I had a chance to give it to the recipient, lest I spoil the surprise. 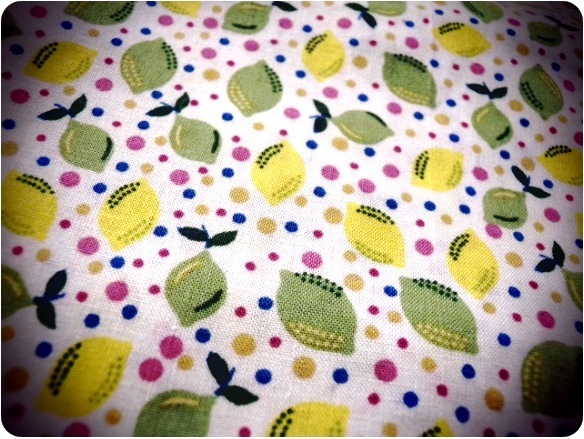 No, this isn’t a new outfit for me, as much as I love the citrus-themed fabric. As short as I am, this is altogether too small even for midgety me. My friends Parker and Rita are about to have a little girl and as far as I’m concerned, every child should come into this world with some one-of-a-kind items in their wardrobe. My Granny and great aunt made tons of clothes for my sister and I when we were little, and sure, some were a bit dated and ridiculous, but many of the outfits were so much fun and made me feel a bit fancy knowing it had been made just for me. Of course, little Rita Jr. won’t have any idea this outfit wasn’t off-the-rack at Target, but that doesn’t stop me from delighting in making tiny lounge wear for the tiny lady. I made this from some contemporary Burda pattern of which I can’t recall the number. I seldom sew from modern patterns so I’m kind of drawing a blank on this one. I just looked for the least awful pattern in the pattern book. I liked that it had little ties at the shoulder, which I faced with green fabric for a little extra flair. Babies need flair. The ties make for cute bows and also allows for fitting adjustments. 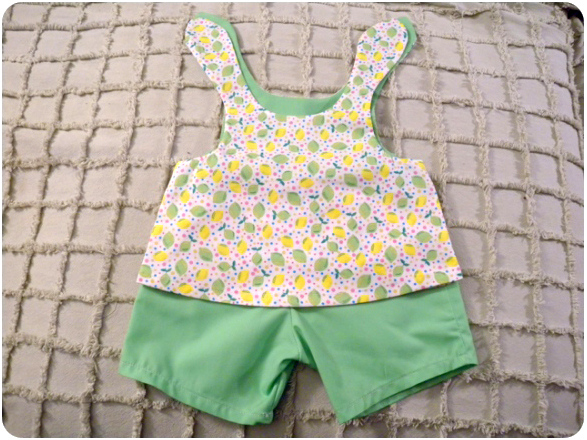 All in all, I think it turned out rather cute, like something Gidget might wear. Anyhow, here’s a close-up of the fabric print. 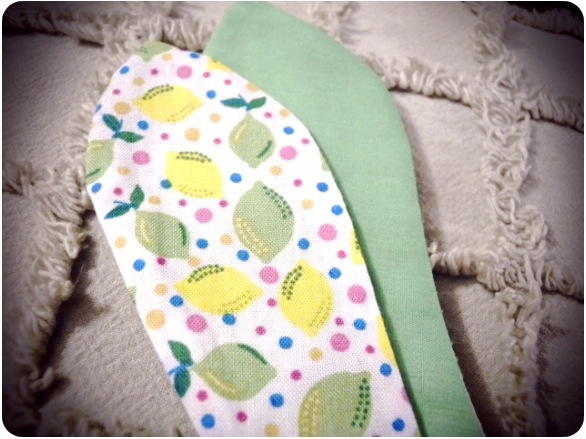 Lemons, limes and candy-dot! 6 Responses to "I’ll never forget the little people"
Adorable! And now I’m curious: have you made canine clothes before? Because my little Rosie would look smashing in that exact outfit; sans headband, of course! Yes, of course! What kind of chihuahua-owning seamstress would I be if I hadn’t made little outfits for them. I have some leftover fabric and I’d be delighted to make an outfit for Rosie! What are her measurements? I’d need neck and chest circumference, and the length from her neck to her hindquarters. What kind of dog is Rosie? We have no idea what Rosie is, as she is a shelter dog (like our other two). When we adopted her as a puppy they said probably dachsund/doberman mix (! ), which I think was based on coloring more than anything. Since her adulthood, our vet seems to think she is a pit mix. She is the only one who will wear clothes (well, sweaters), and seems to enjoy it, as she is a shorthair and often seems cold in cooler weather. Maisie, our bearded-collie mix (think The Shaggy Dog from the Disney movie) is just the opposite: always warm. She likes to sleep in the bathtub, or down in the basement washroom on the concrete! Maisie has been known to wear the occasional festive hat. I’ll send you dimensions for Rosie later; right now she is on squirrel patrol in the backyard. Oh, I love pits and pit mixes! They are all heart. Our pups are shelter rescues too. Vera was an abused backyard breeder dog discarded when she got to old. Seymour was a casualty of the Taco Bell dog craze. I love them both to pieces. I’m such a dog nut. If I walk into a room with a human and a dog in it, I will invariably start talking to the dog first. I suppose that’s either charming or alarming. I look forward to sewing for Rosie. Oh that is completely adorable! What a smartly dressed little behbeh they’ll have. I would totally wear something with that fabric, I admit. Hee hee. I would totally wear that fabric print as well, but I have put a moratorium on making things with light-colored fabric as I’ve come to realize I don’t look good in light colors and end up never wearing it. Too many dresses made that sit in the closet. But on the bright side, that means more fun outfits for other people!